At the beginning of a car crash, it is best to call 911. Stay as calm as possible. Breathe deeply, count to 10 and concentrate. You should check that everyone is well. Turn on your emergency lights and exit traffic. Call 911 to make sure everyone involved in the accident gets medical attention. By calling 911, the police will also arrive. It is important that the police make a police report to know who was the culprit in the car crash. The crash lawyer will get this police report that will help you in your case. After calling 911 and notifying the police, you should keep as much evidence as possible. That is, gather information. Obtain the information of the other driver, his or her name, address, telephone numbers, license plate number, license number, insurance company and policy number. After the police arrive, write down the police report number. Take pictures. Today almost all cell phones have a camera. If you can and it’s safe, take pictures of everything. You should not talk about guilt and take notes of everything you remember about the accident. All this information will be very useful for the car crash attorney. After calling 911, receiving medical attention and keeping evidence, the next step is to call car crash Attorney Javier Marcos. 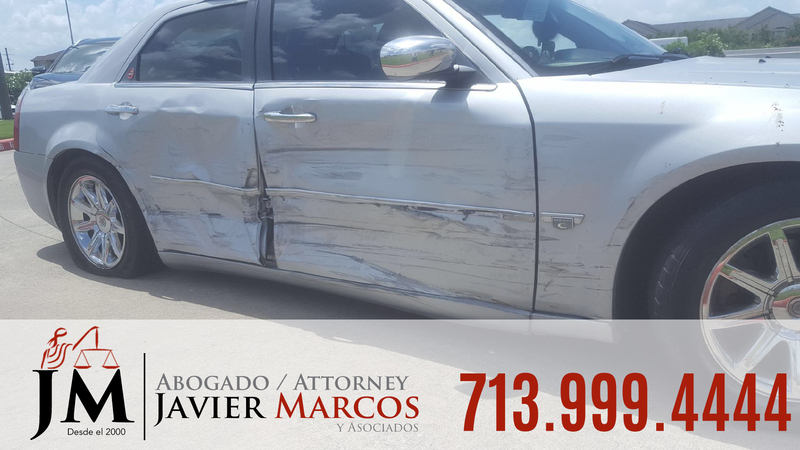 You should never speak to the insurance company, let Attorney Javier Marcos talk to them. The insurance company is trained to ask questions to give you the smallest possible amount of money. That is why attorney Javier Marcos does not recommend that you talk to them. The lawyer will protect your rights and seeks that you receive the greatest possible compensation in your accident case. Attorney Javier Marcos offers free consultation and can dial 24 hours a 713.999.4444.